Welcome to our 64th inventory challenge, which theme is "Resurrect an old maggie"; while searching for an inspiration, I was looking out the window, and started wondering where winter had gone, as I could see the grass in my neighbour's yard... It triggered my imagination, and I just saw my card! Waiting Tilda was just perfect for the scene I wanted to create.Take a close look at her feet... this is how Montreal looked until yesterday! Finally the snow has come, and Tilda will be able to play! Bienvenue à notre 64e défi amical, notre thème cette semaine consiste à "ressusciter une Magnolia d'une ancienne collection". Je cherchais désespérément une inspiration! C'est en regardant les gazôns de mes voisins qu'elle est venue! Waiting Tilda était justement l'image qu'il me fallait pour créer une scène illustrant ce que Montréal avait l'air avant hier... car, la neige nous est tombée dessus, et Tilda pourra maintenant aller jouer avec son traineau. She is from the 2008 Winter collection. I stamped her on Bristol vellum, colored with Faber Castel, and a bit of OMS. My papers are from Webster pages, Collection combo pack. The lovely berries are a gift from a dear friend, the ribbon from Elan, the charm is from my stash, colored with alcohol ink, the stamp (unknown collection) and the tag is spellbinders. Elle est de la collection Winter 2008. Je l'ai étamjpée sur Bristol velin, coloriée avec les Faber Castel, et un peu de Taltine. Mes papiers sont de Webser pages, et proviennent de Scrapbook ta vie, tout comme mes cartons, de Tim Holtz. Les petits fruits en décoration sont un cadeau d'une chère amie, le ruban de Elan, la breloque coloriée aux encres à l'alcohol est de mon inventaire, et l'étampe d'une source inconnue, posée sur une étiquette de spellbinder. I used the wonderful tag from marianne creatables along with the spellbinder scalloped circle and create a flake, on the inside. 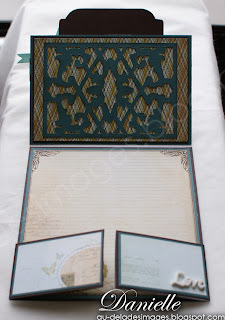 the snow flake border is from a Martha Stewart punch. 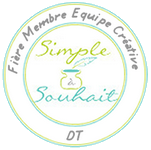 Pour l'intérieur, j'ai utilisé l'étiquette de marianne Creatables, disponible chez Scrapbook ta vie, le cercle de Spellbinder ainsi que le flocon, le poinçon snow flake de Matha Stewart pour la bordure. Please take a moment to visit Christina and our lovely team members. they have certainly created eye candies for you! Prenez un moment, et visiter Christina et les autres membres de l'équipe. Elles ont certainement créé de fabuleuses cartes qui sauront vous inspirer. 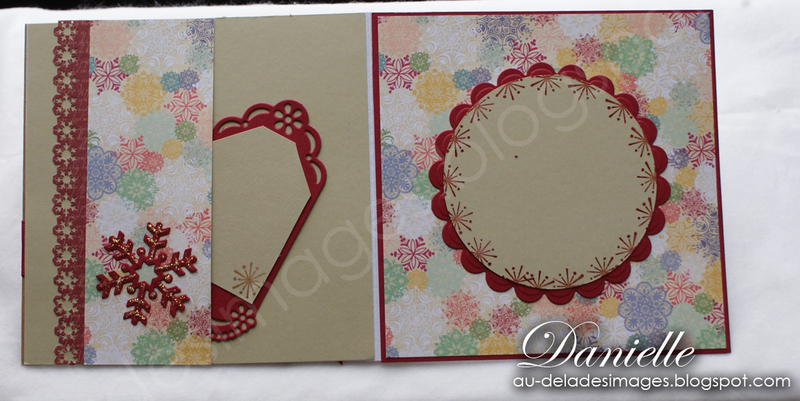 PS: below is the inside of my card last week, it is the double dutch fold card style. Vous trouverez ci-dessous, l'intérieur de ma carte de la semaine dernie`re... c'est un style de pliure qui s'appelle le double dutch fold card. Danielle!!! It´s adorable!!! 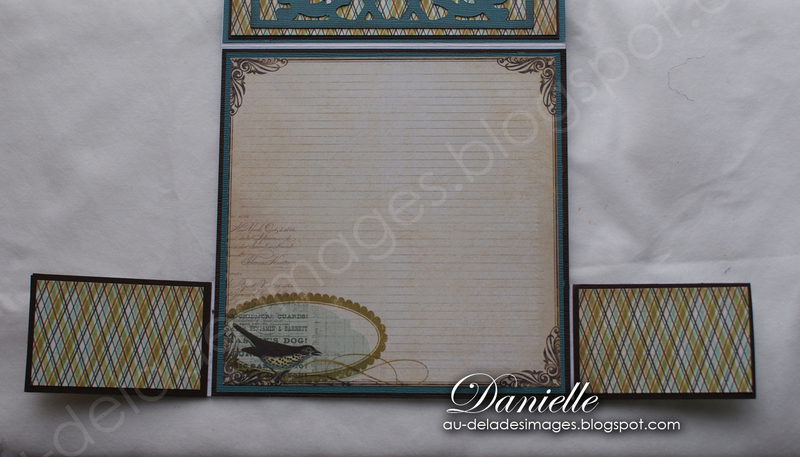 Love how you've colored the image and the wonderful layout and papers!! The embroidery you did inside is so cute!!! As always... you did an amazing job!! Good Morning Danielle. Holy Smoke you're INCREDIBLE!! This card is totally brilliant but GORGEOUS as well! Waiting Tilda is beyond precious and your coloring is PHENOMENAL! The inside is also awesome. Love that tag. Oh and the inside of your other card is also FABULOUS!! Gee I think I'm running out of words. I guess you can tell that I love it all! Danielle this is gorgeous work!!!!! Wow love the image and your design!!!!!Splendide!!!!! OMG...this is incredibly GORGEOUS..absolutely breathtaking! Your coloring of this adorable Tilda is phenomenal. You certainly create magic with those Faber Castel pencils!!!!!!!! 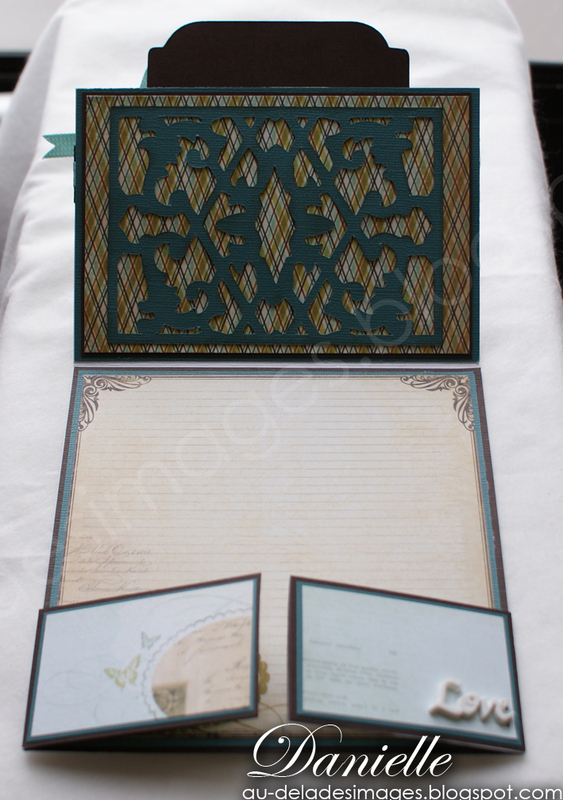 The inside of your card is as gorgeous as the outside.....love the papers!!!! The embellishments, as always, are perfect. Love the look of your coloring on the vellum!! Beautiful card Danielle! Fabulous card. Tilda does look like she is waiting for snow. We are getting a bit now. Lovely embellishments. The inside of the your card from last week is fantastic - I would like to learn how to do that! Your card this week is beautiful - Love your embellishments. Poor Tilda, she really looks as if she is waiting for snow (or someone)! A beautiful card Danielle. Did you really get some snow!?! Like Tilda, I am still waiting and waiting and waiting. Magnifique ta carte! J'adore ta coloration. Ton intérieure est splendide. bravo!! What an interesting card design. I really like all the flips. Tilda is beautiful as is your entire project. It's wonderful! Oh wow! Isn't she darling?!? I love the multicolored snowflakes behind her. Fabulous! We finally got a dusting of snow but not enough to really play in...which is good because it is COLD outside! I just love your card! Everything matches so well and all those layers! Love the snowflake cs. Tilda and her sled are colored to perfection. Love that bouquet. The inside is just as gorgeous at the front. 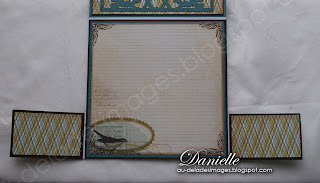 Wow Danielle, love your card and the color scheme you've used! Very pretty! I love the old fashion feel of this card. It is gorgeous! What a wonderful card Danielle!! Everthing is so beautiful. I love your old Maggie and the way you have colored her. This is just gorgeous Danielle! Your coloring is beautiful, just beautiful! I love the pieces of Christmas picks you used for your floral arrangement and the way you ran your ribbon under Tilda's feet! Simply stunning inside and out! encore une merveilleuse carte...les Tilda sont toujours actuelles même si elles datent d'un certain temps. Colorisation parfaite...ah ces doigts de fée! Just gorgeous I do love the older Tildas. The scene that you made is great love how she in looking for the snow.... so cute. Ta carte est vraiment splendide. J'aime beaucoup l'utilisation de ton papier à motifs, le tout est bien dosé avec tes embellissements! J'aime beaucoup également la découpe à l'intérieur de l'autre carte! bonjour ma belle Danielle!! !ta carte est vraiment superbe!!! !comme toujours ton coloriage est réussi et parfait! J'aime beaucoup aussi ton joli bouquet et tes merveilleuses découpes à l'intérieur! Hi Danielle. Your card is absolutely gorgeous. I love the richness of the colors, your beautiful berries, and this sweet Tilda, so beautifully colored! Have a fun weekend. Ta carte est superbe Danielle. J'adore l'effet du crayon. Le choix des papiers est très harmonieux comme toujours. J'ai déjà hâte de voir le prochain défi de la semaine prochaine! 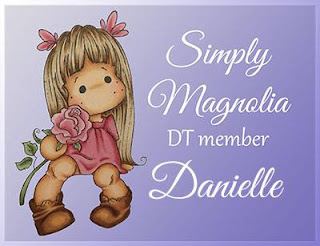 Danielle, such a beautiful card, your colors are so amazingly gorgous and stunning.. love the berries and the and Tilda in the cold wind, but no snow.. One of your greatest cards!! Very rich looking card, I love the berries and ribbon accent. I love the inside of last weeks card, that design is really neat. Oh my GOSH Danielle! This is soOoOoo darned GORGEOUS! I love this "old" Tilda image which you've coloured FABULOUSLY as always! And your bow is just as lush as could possibly be! Wowwww! Noooowwww .. the other card from last week .. that is simly INCREDIBLE my dear! The inside is mind blowingly gorgeous! I knew it!!!!!!!!! Whew! Love love love it!! !